"They will fall away eventually. It will never last." It is a common view on Leicester City's position as Premier League leaders. "If Leicester win the Premier League, I'll do the first Match of the Day next season in my underwear," said the club's ex-striker Gary Lineker last week. Following victory at Everton, the Foxes are top at Christmas. So has the Match of the Day presenter made a hasty Twitter statement? BBC Sport spoke to fans and former players to look at why Leicester could become champions of England for the first time. "Hearing the roar from the crowd makes us believe anything is possible," top scorer Jamie Vardy wrote on a clapstick given to every fan at the home game against champions Chelsea, a match Leicester won 2-1. Results make his words feel far from empty. The Foxes have scored more goals than any other side in the league and only Liverpool can boast more tackles this season. "You can tell something special is going on," season-ticket holder Adam Tomlinson told BBC Sport. "At the moment around Leicester we are going into every game thinking we can get three points out of this." Some bookmakers marked Claudio Ranieri's side at odds of 2,500-1 to win the title at the start of the season. A league win would arguably be the biggest shock English football has seen, certainly since Ipswich lifted the title in 1962, 12 months after promotion. 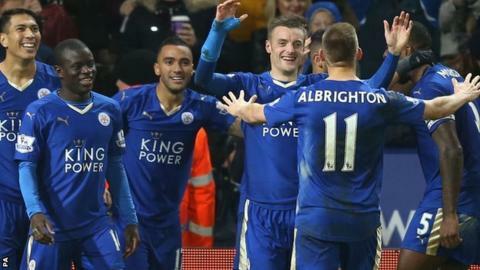 "They play like a team who have no fear and nothing to lose, who are positive in everything they do," former Leicester striker Steve Claridge told BBC Sport. "You have to start taking them seriously." Vardy and Riyad Mahrez cost the club less than £1.4m in total. They sit first and joint-second respectively in the league's goalscoring charts. Mahrez has either scored or created 20 goals, Vardy 18 - no player in the top tier has more. "Mahrez is doing things with that left foot that I have only seen Lionel Messi do," ex-Liverpool defender Jamie Carragher told Sky Sports on Monday. Over three million players in the Premier League's Fantasy Football game cannot get enough of the pair - who are the most popular players in the competition, with Mahrez chosen in 65% of teams, Vardy 58%. "People are becoming aware but still can't handle them," former club captain Matt Elliot told BBC Sport. "If they continue the form then Leicester have a genuine chance of not just staying in the top four but staying in the title race. "Vardy is incessant in his appetite and desire for the game. Mahrez is just pure quality. The two are as potent as anything we've seen in recent times." A hard-earned win at Everton saw goalkeeper Kasper Schmeichel and defender Danny Simpson use heart-shaped emojis on Twitter to outline their feelings for their team-mates. Such an outpouring of emotion and spirit is far from uncommon among Leicester's players this season. Goals are often celebrated as one, with players racing to get involved. Underpinning the bond and energy is drive. Mahrez and Vardy are driven forward by the energy of midfielder N'Golo Kante - a £5.6m summer signing who has made the most interceptions and tackles in the league. "Kante is the beating heart of the side," Tomlinson added. "Every time you go into a match you think we can score goals, break up in midfield - we have got a chance in any match. If we strengthen in January - maybe a right-back and a new partner for Vardy up front - people would have to take us seriously then." There are other reasons for optimism. Winger Marc Albrighton has six assists this year - only Mahrez, Arsenal's Mesut Ozil and Everton's Gerard Deulofeu have more - while Leicester's bench in their win over Chelsea underlined their experience, boasting 386 international caps. Elliott added: "Over time they have built a very good squad which doesn't always get mentioned. There is a lot of depth and quality. That will be tested." At 64 and with his 15th different team, Ranieri has seen a lot of what football has to offer and has noticed an "electricity" in the stadium. "Without that we are a normal team," he told reporters. So what wins? The Italian's overall experience, including two second-place finishes in Italy's Serie A? Or the fact he has never delivered a major title? "The pressure won't faze the manager," Elliott said. "He has made small adjustments but his lack of changes since taking over has actually been impressive." Ranieri - often ridiculed with the handle 'Tinkerman' for squad rotation in the past - has made just 13 changes to his starting line-up this season. His reward for consistency? A team packed with endeavour which has made more interceptions than any other in the Premier League. Only Borussia Dortmund, Bayern Munich and Paris St-Germain have scored more top-tier goals across the continent. That is esteemed company. With a certain charm, Ranieri has expertly taken pressure off his side so far by declaring his simple focus of staying in the league. He may not be able to deflect such questions for much longer if the incredible form continues. Leicester beat Everton but can they do the same against Liverpool and Manchester City in their next matches? "Who is going to run away with it at this stage?" Claridge asks when analysing Leicester's title chances. "Normally someone says: 'Thank you very much' and runs away with it. Everyone is inconsistent, everyone is vulnerable." Inconsistency seems commonplace in the 2015-16 campaign - the longest current run of wins in the Premier League belongs to Watford (four). "Good sides are not as good as they used to be and the other sides are better because of the levelling in money," added Claridge. "It's then not a case of buying success - you have to manage." So with just two league defeats since April, is Leicester's long-term consistency more evidence that the unthinkable will happen? Any side will probably have to score twice to beat the Foxes, who have found the net in 26 of their last 27 league games. It is a record which will give hope for supporters pinching themselves and contemplating an unthinkable title assault. No team leading the Premier League after 17 games have finished outside the top four. Foxes fans would probably take Champions League football now, but as Ranieri has said: "they continue to dream". Read more on Premier League: The most unpredictable season?